Purchase the eBook directly from the publisher and download the book immediately. Order the paperback from the world’s most trusted online store, Amazon.com. Read this book as part of a Safari Books Online subscription and gain access to hundreds of other titles. Order the eBook from O Reilly. 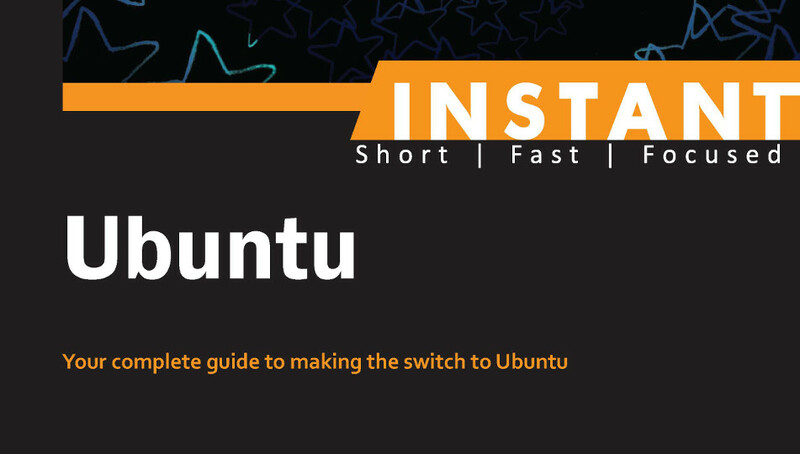 Instant Ubuntu – Complete guide to making the switch to Ubuntu! Download and Install the world’s most popular Linux distribution. Connect with friends and family online using Firefox, Chrome and social media! Install new applications using the integrated Ubuntu Software Center. Play your favorite music even when you’re on the go with Ubuntu One music streaming! Be productive with LibreOffice, the free office suite. More and more people are hearing about Ubuntu every day. This version of the free and OpenSource Linux Operating System is user-friendly and ranks as one of the most popular versions in the world. It is freely downloadable and millions of people are trying it as an alternative to more common, expensive systems. Although the Ubuntu Documentation is comprehensive, detailed and very readable, it can be a bit daunting for the beginner. Similarly, there are numerous books about Ubuntu. Some as thick, expensive and formidable as a desktop PC. This is where Instant Ubuntu by Christer Edwards comes into its own. It is a short, sharp, nifty guide to downloading and installing (to try or to keep) Ubuntu on your computer. It provides detailed, illustrated instructions to get you up and running. And although this is a simple process, it is reassuring to read through it before proceeding. It then provides an introduction to the Unity Desktop layout and functions, followed by a brief description of the applications included in the Ubuntu package. A third section expands on these applications and features and finally the book provides links and descriptions of useful websites, forums and groups. As a small, simple book one is tempted to call Instant Ubuntu an Idiot’s Guide but no newcomer to Linux or Ubuntu is considered an idiot. This book answers the simplest questions clearly and without “geekspeak”. This book is exactly what it ought to be. Simple, direct, clear and concise. This book will have you up and running on Ubuntu in no time with helpful instructions, screen shots and basic customization tips. Written by a Linux pro and someone with a clear grasp on the subject matter. If you’re curious about Linux but hesitant about how or where to jump in, this is the perfect guide for doing so, even if you just want to give in a try on a temporary basis. I am going through this book, has been referred to me by a friend of mine, to my surprise this is just 54 pages book, which makes it a quick and easy read and which also helps user to quickly get started with their experiments on Ubuntu and Linux as whole, this book is a nice starter book for users who are new to Linux, the installation concepts and what you will get after you buy this book will give you enough information to get started with Ubuntu. The writing is nice and clear and may help users to understand the concepts easily. This book is for beginners and make them understand Linux concept in a layman language. It is good that someone has written such a short book to make a newbie understand the basic concept of Ubuntu, without going and confusing the user inside the nitty-gritty of inner workings of every component(i believe a newbie like me will not be much impressed with that, and that may mainly act as a pullback), which can help in further pursuing their adventures with Ubuntu. I would recommend the author to also put some nice introduction to USB installation methods,so Netbook users can also take Ubuntus full advantage. I would recommend this book to every beginner. Get in touch with the author below, or send an email to [email protected]. Instant Ubuntu is available now! Get the eBook, Kindle or Paperback.